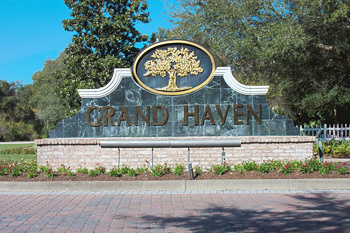 Grand Haven is a gated, private community bordered by the scenic Intracoastal Waterway and surrounded by a 4000 acre nature preserve. Residents of this 1400 acre residential golf community can enjoy a Village Center with fitness club and spa, pools, group recreational activities, clubs, events, restaurants, and café. Or they may choose to indulge in outdoor strolls or bike rides on the picturesque wooded pathways and parks. The possibilities for contented living in Grand Haven span every age and interest. Although Grand Haven is large enough to contain home sites for almost 2000 houses, half of its expanse is dedicated to archaeological sites, freshwater lakes, recreational areas, and thriving nature. Perhaps the most well known feature of Grand Haven is the award-winning par 72, 18-hole Jack Nicklaus Signature golf course and accompanying country club. Only minutes away are beautiful Atlantic coast beaches for your enjoyment to be complete in your new home in Palm Coast. In addition to pools and exercise facilities, Creekside Athletic Club offers an indoor lounge and game room; playground; junior soccer field; shuffleboard and horseshoes; volleyball, clay tennis, and basketball courts; outdoor grilling area; and community fishing pier. If you like to jog, rollerblade, or just take a nice walk you can on the 2-mile long, 10-foot wide path along the river or make use of the sidewalks throughout Grand Haven. Grand Haven is comprised of many individual villages with homes that range from maintenance-free condominiums and townhomes, as well as single family homes of all sizes and tastes including patio homes, golf villas, and waterfront estates. Perhaps you would prefer to choose from an abundance of custom builders and high quality floor plans, or take it to the next level and design your own dream residence. Your new home in Palm Coast has no limits in Grand Haven. See homes for sale in the Grand Haven golf community of Palm Coast, quickly accessible from several community entrances including the main gate located on Colbert Road at the east end of Palm Coast.